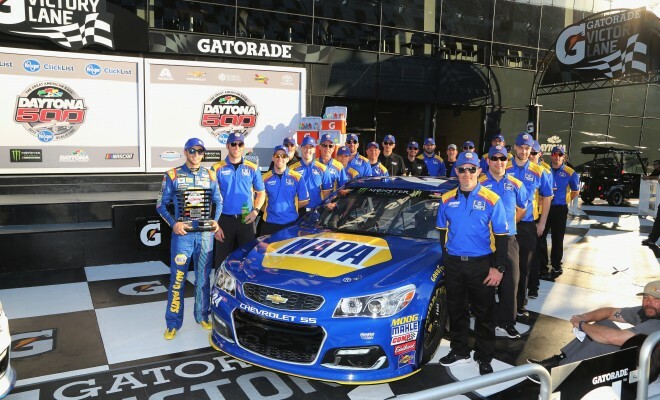 DAYTONA BEACH, Fla. — Winning back-to-back Daytona 500 poles is something of a family tradition, as Chase Elliott proved by the skin of his teeth Sunday at Daytona International Speedway. 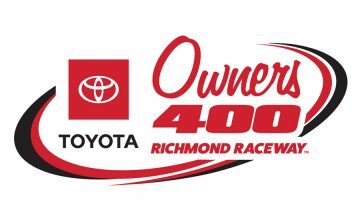 The last driver to take a lap in the second and final round of Monster Energy NASCAR Cup Series qualifying at the 2.5-mile superspeedway, Elliott covered the distance in 46.663 seconds (192.872 mph) to edge Hendrick Motorsports teammate Dale Earnhardt Jr. by .002 seconds. The pole was the second straight for Elliott, who led the field to green last year as a Sunoco rookie. It was the third straight for Elliott’s crew chief, Alan Gustafson, who won the pole with driver Jeff Gordon in 2015 in Gordon’s last year as a full-time driver. With three straight poles as a crew, Gustafson shares a record previously held solely by Ernie Elliott, Chase Elliott’s uncle, who fielded cars driven by former Monster Energy NASCAR Cup Series champion Bill Elliott, Chase’s father. “Everybody at Hendrick Motorsports has done a lot of work this off-season,” said Elliott, who claimed the third Coors Light Pole Award of his career, all at restrictor-plate tracks. “This team definitely has a knack for these plate tracks, as they showed with Jeff Gordon and then last year with here and Talladega (where Elliott also won the pole). “But that stuff doesn’t just happen by staying the same, as everybody knows. Everyone is always trying to get better and make their cars better and faster, and the engine shop is always finding new things. So I think that’s just proof that they’re improving with everybody else and taking that next step, which is really impressive. Elliott and Earnhardt are the only two drivers locked into their starting spots for next Sunday’s 59th running of the “Great American Race” (2 p.m. ET on FOX, MRN, SiriusXM NASCAR Radio). 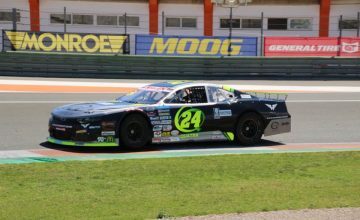 They will lead the field to the green flag in both Can-Am Duel 150-mile qualifying races on Thursday night (7 p.m. ET, FS1, MRN, SiriusXM NASCAR Radio) — Elliott in the first Duel, Earnhardt in the second. Earnhardt is racing for the first time since a concussion sidelined him for the final 18 events of the 2016 season. The satisfaction of locking in a front-row starting position tempered his disappointment at missing the pole by the slimmest of margins. Brad Keselowski qualified third at 192.691 mph and will start on the outside of the front row in Thursday night’s first Duel. Clint Bowyer, in his first competitive effort in a Stewart-Haas Racing Ford, will start beside Earnhardt in the second Duel after posting the fourth-fastest speed (192.571 mph). Conversely, Jeffrey Earnhardt and Timmy Hill, who posted the two slowest times in the field, can race in the 500 only if they are the fastest Open drivers in their respective Duels.